Connecting the Dots...: Killer Frogs! Meat-eating killer frogs have invaded a pond in San Francisco's Golden Gate Park, leaving environmentalists wondering how to stop their deadly march before they move on to bigger waters. 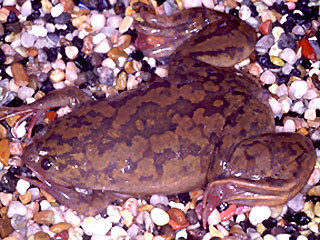 The African clawed frogs have chomped through everything from turtles to fish in Lily Pond, near the California Academy of Sciences, the San Francisco Chronicle reported. The frogs, which can grow up to 5 inches in length, have even gone cannibalistic. "They've eaten everything they can get their mouths around, and now they're eating each other," Eric Mills of the animal-rights group Action for Animals told the newspaper. These frogs sound familiar. I wonder what Internet screen names they have been using?